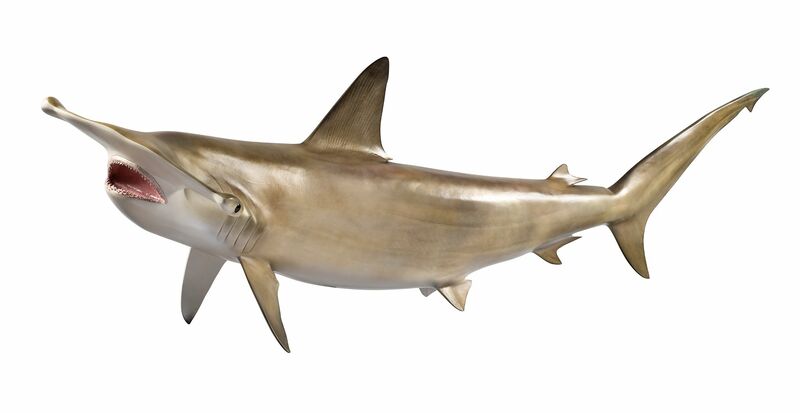 Learn why hammerhead sharks evolved their unique head shapes in the new Science exhibition at the Beuce, Sharks! Few creatures inspire so much fascination – and fear – as sharks. However, sharks are far from the mindless killing machines that they are commonly portrayed to be. Now on view at the Bruce Museum in Greenwich, CT, a new exhibition, Sharks!, will pose this question: How much of what is commonly “known” about sharks is fact, and how much is fiction? To answer this question, visitors to this interactive science exhibition will get up close and personal with life-sized models of a great white, hammerhead, and some of their living and extinct cousins. They will watch live sharks developing within eggs, and compare and contrast jaws from nearly 20 different species. Sharks! will also address environmental change. The oceans are growing warmer and increasingly impacted by chemicals, plastic, and other manmade pollutants. Sharks are harvested by the millions to feed a seemingly insatiable demand for shark fin soup and other products. Can these ancient predators survive in the Anthropocene Era? Sharks! will be on view in the Bruce Museum’s Science Gallery through September 1, 2019. The exhibition will be complemented by a series of educational workshops, programs for school groups, and presentations. Educational programming will focus on confronting myths and misconceptions about sharks, such as the notion that sharks are inherently dangerous to humans. On Tuesday, May 14, 6:30 – 8:00 pm, Captain Jesse Paluch, Chief Environmental Conservation Officer, NYS ENCON Police Bureau of Environmental Crimes Investigation, will present “Predator Turned Prey: The Controversial Trade in Sharks and Shark Fin Products.” His talk will take us behind the scenes to uncover the hard truths about the worldwide trade in shark products, what effects it is having on species’ populations, and the local and global efforts to restrict the illegal trade. The Museum will open at 6:30 pm; with light refreshments preceding the lecture, which begins at 7:00 pm. Members and students with ID, free; non-members $15. Reservations required.